Arthur Goss’s career began at age 11, working for the city government to support his family after his father died. It was the 1890s and Toronto, Ontario was beginning to expand and enter the period that saw government public works projects bringing urban areas out of the Industrial era and into more sanitary, livable conditions. Around this same time, city officials began to understand the documenting prowess that photography yielded. Thus Goss, whose skill with a camera was awarded when he was as young as 15, came to be the first official photographer for the city in 1911. He recorded new roads, sewers, transit lines and bridges as Toronto swelled. His career ended with his death in 1940, at which point he had produced 35,000 images for the city, each negative of which was labelled and filed away for future reference. Today, they are housed at the City of Toronto Archives. Read the full article chronicling Goss’s prolific career at CityLab/Life. This entry was posted in architectural history, architecture, photography, planning, urban design on August 15, 2018 by Kathryn Dictus. Is It Real or Rendered? As discussions of representation in design schools recognize our current collective shift into the postdigital era, Susan Piedmont-Palladino writes a pertinent article in Places Journal investigating our ever-changing relationship to images and representations of reality. Piedmont-Palladino goes on to note that design renderings often depict an overlap between real and imagined, but that there are implications for design when architects or others choose to ignore certain realities beyond the point of making beautiful drawings. Not addressing issues of universal access during the design process, for example, can lead to exclusion and failure to meet building codes. Head over to Places Journal for the full article. This entry was posted in architecture, art, image presentation, images, photography, technology on August 7, 2018 by Kathryn Dictus. It seems that half the motivation for people to travel is to capture the exact photo of a place or a building that everyone else has taken. The most photographed gargoyle is one example, or that Leaning Tower of Pisa photo we can all readily picture in our minds. It’s no surprise, then, that when the Spanish photographer Andes Gallardo Albajar visited the Great Wall of China, he expected to capture one of the seven wonders of the world with a bunch of tourists milling about. Instead, Albajar found the Great Wall overrun not with people but with fog. As a result, he was able to shoot stunning, people-free images of the Wall in a ghostly blanket. Incidentally, the fog also obscured much of the surrounding landscape, so the Wall is eerily portrayed devoid of its contextualizing topography. You can find more images of the Great Wall of China and its environs in the VRC’s Online Image Collection here. This entry was posted in architecture, images, photography, travel on August 3, 2018 by Kathryn Dictus. In April 2018, Joel Meyerowitz’s photographic works spanning nearly 50 years were published in a retrospective book titled Where I Find Myself. At 80 years of age, Meyerowitz still feels rooted to the artistic values with which he began his career. He is most noted for capturing spontaneous moments on the streets—frames of the scene of life that unfold around us, easily lost in a split second of time—thereby imbuing them with significance they would not otherwise have had. Now, finding himself shooting still lifes, he rationalizes that there is an energy in the way objects relate to one another and express their own lived histories, much in the same way humans do. He wonders where he will find himself in the next ten years. This entry was posted in art, images, photography on July 30, 2018 by Kathryn Dictus. Taken in any other city, Tom Blachford‘s photographs of Los Angeles would be utterly unremarkable. They portray such ordinary things as empty residential street corners, puddles in alleyways and glowing back porch lights. Devoid of people, motionless and eerie, these photos capture one of the more image-conscious places in America in a stark but not unflattering new way. Setting out to shoot LA without any of the cliches, Blachford found that his intention to shoot “day for night” was undermined by a rainy forecast. 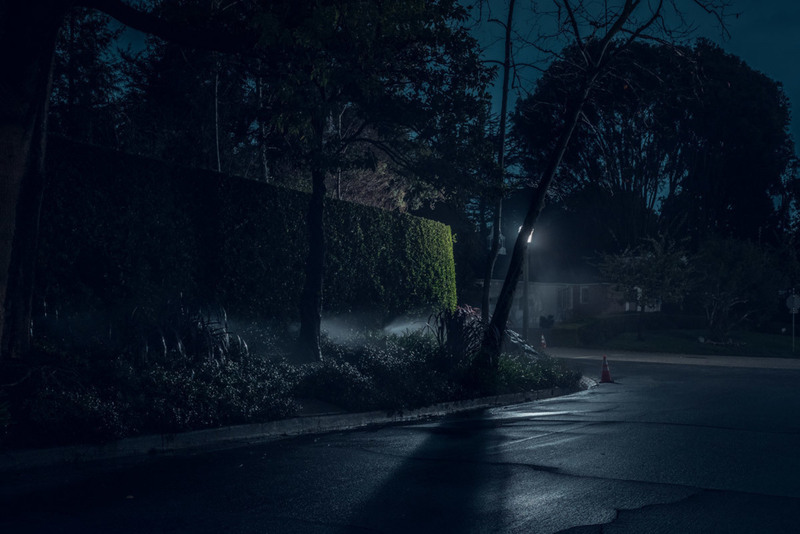 His prior series “Midnight Modern” was shot using the opposite technique, with moonlight masquerading as day time, but this too was nixed due to LA’s extreme light pollution, which gives the sky a chronic glow. In the end, Blachford found that the technique of simply shooting in the rain at night produced better results than he could have anticipated. This entry was posted in art, images, photography on May 22, 2018 by Kathryn Dictus. Photographer Kris Graves has documented all of New York City’s 77 police precinct buildings. The architectural styles used evolved over the years, reflecting trends in architectural design as well as the police force’s evolving needs. During the 19th century, most precincts were built in the Romanesque or Classical Revival styles, By the 1960s, the buildings were largely un-ornamented. Now, New York City’s police force is considering how their precinct buildings’ architecture impacts their relation to the community. While Brutalism may have its merits in the history of design and architecture, there is little doubt that a monolithic concrete building may fail to appear like anything other than a fortress. In a time when the tension between police and the communities they aim to serve has perhaps never been higher, precincts hope to convey an openness through the design of their buildings. The most recent proposals feature interior public spaces to allow community meetings and engagement. This entry was posted in architectural history, architecture, community, photography on May 2, 2018 by Katherine Hill. “Better together.” That’s the message this week as two photo sharing giants come together. SmugMug was founded in the early aughts by photographers who knew the digital age meant it was time to develop a way to share digital photos. Flickr was founded by a Canadian corporation in 2004 and quickly acquired by Yahoo, where it grew into a massive platform with more than 80 million users. However, Flickr struggled to keep up as Facebook and Instagram revolutionized the way we share images on the Internet. Despite this, Flickr stayed popular with both amateur and professional photographers for its core functionality: the ability to browse, share and display high quality images with a community of peers. Additionally, Flickr offered free accounts, while SmugMug charged a small subscription fee. SmugMug has stated that it intends to continue to operate both Flickr and SmugMug as separate platforms and services, and invest in both moving forward. SmugMug has also reassured dedicated Flickr users that their free accounts and thousands of photos aren’t going anywhere. Only time will tell what changes this move will have on the online photography community, but so far there has been great enthusiasm for the acquisition. Source: The Guardian and SmugMug. This entry was posted in images, photography on April 27, 2018 by Katherine Hill. Photographer Reuben Wu has been using adapted drones to light-paint in natural environments, creating beautiful and otherworldly landscapes. His image series “Lux Noctis” transform natural landscapes into images that evoke ideas of extraterrestrial exploration and science fiction. Wu’s photos endeavor to explore unknown and hidden places and present them as if they were a memory of a foreign place. Wu uses drones to create light trails around rock formations and to provide supplementary light from above. The long exposure images are ethereal, colorful, and otherworldly. His other work similarly blends landscape, futurism and architecture. This entry was posted in art, images, landscape, photography on March 8, 2018 by Katherine Hill. The Berlin Wall stood for 28 years, bifurcating the city into West and East Berlin respectively. Demolition of the wall began in 1990, and 28 years later, an exhibition at the Venice Biennale of Architecture 2018 will be exploring the question of what happens to the built environment when physical divides are torn down. The exhibition, titled “Unbuilding Walls,” will showcase 28 examples—one example for each year the Berlin Wall divided Berlin—of historic and contemporary walls, barriers and fences and their effect on or reaction to the landscape. In 2012, astronaut André Kuipers documented one example of the wall’s divide still evident from space: the color difference in the street lights of and west and east sides of the city is clearly perceptible. Source: Topos Magazine and the Washington Post. This entry was posted in architectural history, architecture, exhibition, historic preservation, landscape, photography, space on March 6, 2018 by Katherine Hill. Analog photography is getting a revamp. The first Single Lens Reflex (SLR) film camera designed since the 1990s was successfully backed on Kickstarter at the end of 2017. The project, simply titled Reflex, is on track to be available for sale in August 2018. In many ways this camera takes everything back to the very basics: it requires one to manually focus the lens and advance the film. However, a few key features make this film camera a massive leap forward compared to the Pentax K1000 bodies still found on eBay. The Reflex team was determined to create as flexible and modular a tool as possible. First, the interchangeable “I Plate” lens mount allows photographers to use lenses they already own from brands like Pentax, Minolta, Canon and Olympus. An interchangeable film back means changing from color to black and white film is easy, or from a fast film to a slow one. Bluetooth connectivity, while it might seem gratuitous on an analog camera, will allow photographers to quickly take notes on their shots as they compose them, and log their settings for future reference. Finally, Reflex is determined to allow open source development for their camera using 3D printing so individuals can create their own accessories. While the price point will likely be comparable to an entry level Digital SLR, revived interests in almost-obsolete mediums like vinyl LPs have shown that people are willing to invest in keeping older formats alive. With the flexibility and the promise of open source development that Reflex offers, it’s hard to imagine they won’t have some enthusiastic adopters. Source: Reflex Kickstarter and The Guardian. This entry was posted in photography, product design on February 19, 2018 by Katherine Hill. Photographer Tom Blachford’s series ‘Nihon Noir’ calls to mind futurism, science-fiction, film noir and yes, the 1982 cult classic film Blade Runner. Blachford was inspired by the Metabolism movement era architecture in Japan, and his images showcase its unique intersection of architecture and infrastructure. Metabolism was a post-war movement brought to the international stage during the 1960 Tokyo World Design Conference. The designers behind the movement organized their vision into a manifesto entitled Metabolism: The Proposals for New Urbanism, which described a design ethos focused on meshing mega-structures with organic shapes. The most prolific member of the movement, Kenzo Tange, worked as a designer, architect, and urban planner until his death in 2005. This entry was posted in architectural history, architecture, landscape, photography on February 6, 2018 by Katherine Hill.